"I was cycling to the gym when a taxi driver swung his door open in front of me. I didn’t have time to take evasive action and went over the handlebars, ending up shaken and sore but only too aware it could have been much worse. The taxi driver was very apologetic, picked up my bike and gave me his mobile number but I didn’t make a note of the taxi’s registration number. To be honest, as it was dark and I wasn’t familiar with the area, I simply wanted to continue my journey. When I arrived at the gym, as well as my neck and back being very painful, I realised I had extensive bruising on my left arm and right hip. However, I was still being very philosophical about everything. After all, it had been an accident. As my bike had taken a bad hit, I decided to get it checked and discovered the frame had been broken by the taxi door. I called the taxi driver to let him know – and that’s when he turned nasty. He was very aggressive and said it was my fault and he was going to sue me for hitting his taxi when I fell off my bike. But I definitely wasn’t to blame. 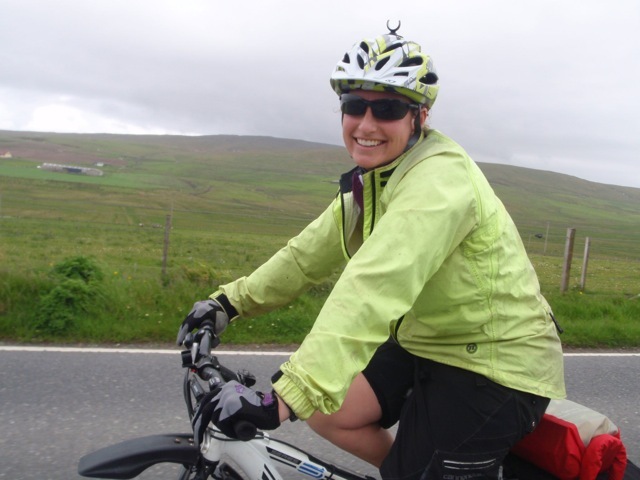 When the accident happened, I was cycling carefully alongside a row of parked cars, with my front and rear lights working, reflectors on my bike, wearing a high visibility jacket and a white cycle helmet – he should have seen me. I was upset and very worried and so when my partner came home, he went online to find a lawyer who specialised in cycling accidents. The first legal firm we contacted was in England and, when I told them I didn’t have the taxi’s registration number, they lost interest. I felt stupid, helpless and completely out of my depth. Then I called Brenda Mitchell at Cycle Law Scotland. Right from the start, Brenda was so supportive. Brenda told me I was entitled to compensation for my injuries and the loss of my bike and said she would deal with everything, including asking the taxi driver not to contact me again. As we chatted, I could feel an enormous weight lifting off my shoulders. Brenda kept me updated on progress and refused to let the taxi driver’s side drag their heels - but what impressed me most was how caring she was. And, despite my accident not being nearly as significant in terms of injuries or damage as some of the cases Brenda must handle, I always felt I was a priority. Ten months later after an action was raised in Court, my case reached its conclusion. I was very pleased with the outcome, although winning the case was secondary. I just wanted someone to help me and reassure me everything would be okay – and it was.